As always, Solstice Scents packed their goodies well, leaving little room for movement or breakage. I received three scent cards to go with my order, each side holding a lovely picture of various fragrances. 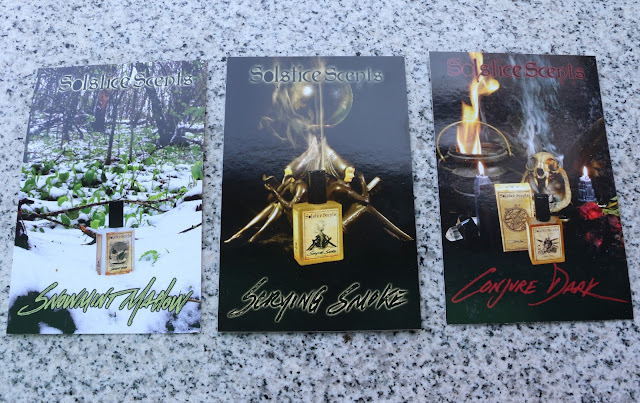 Solstice Scents trading card game, anyone? One of the cards had a handwritten thank you. Since my last order they have introduced new sample sleeves, and I must say I'm a fan. 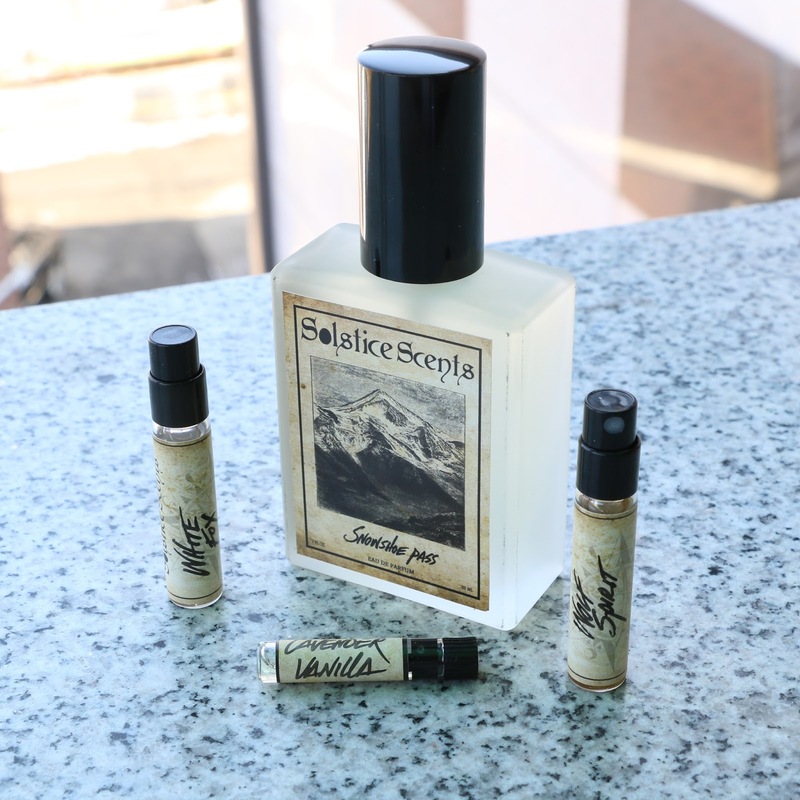 It continues the gorgeously rustic esthetic I've come to appreciate from Solstice Scents. 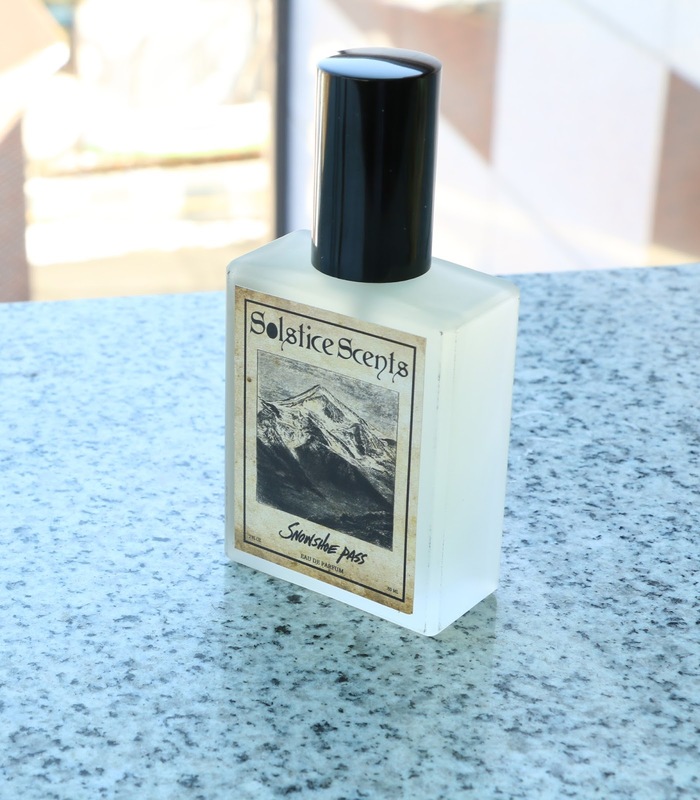 Snowshoe Pass: White amber, white musk, vanilla accord, peppermint cream, cold winds. 60ml eau de parfum for $60. Wolf Spirit: Desert sage, pinyon pine & resin, conifers, cedar, vetiver, palo santo, soft incense, frankincense, fur & juniper. 2.5ml eau de parfum for $8. Now that I've had time to wear the scent without my body's chemistry messing it up, I can say this scent continues to be amazing. Cedar and vetiver, juniper & frankincense. A lovely medley, almost smoky in nature, perfect to warm up and tone down the mood. White Fox: Vanilla musk, white fur, wood blend, frozen dirt, snow. 2.5ml eau de parfum for $8. Crisp, fresh dirt. A slight vanilla note. Woody. Playing outside in the icy forests while fall gives way to winter. All of the nature without being unclean. A lovely scent on its own, but I find myself even more in love when I combine it with Snowshoe Pass. Lavender Vanilla: Lavender essential oil, lavender absolute, sweet creamy vanilla. My sample of choice for this order. An herbal lavender & vanilla scent. This particular blend does not have that metallic note some herbal lavenders have. Pretty simple and well known but still a lovely concoction for those who love lavender vanilla. That about sums up my order. Next on my to-buy list is a full bottle of White Fox and an eau de parfum in Lavender Vanilla. Have you tried Solstice Scents? What do you think of it? 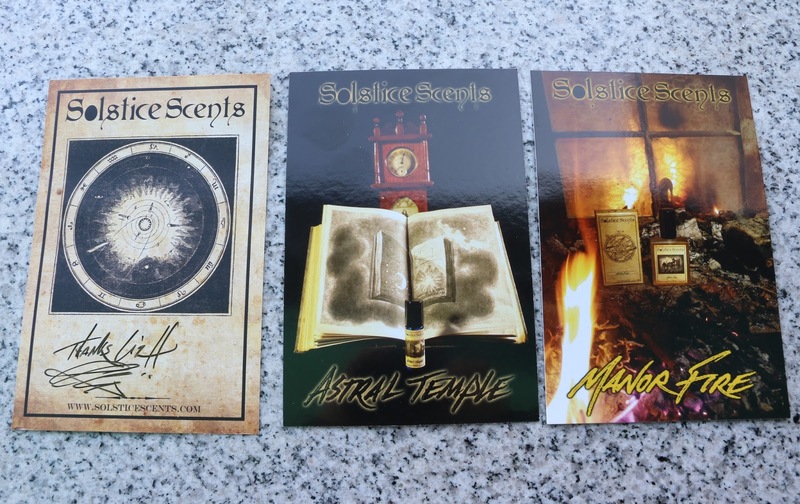 Great to read all the Solstice info. Snowshoe pass sounds pretty incredible and versatile. Between, yours, Julie's and Sandra's beautiful posts on this brand, if y'all don't make me order then nothing will. Hope you are well. The past two months really have been great for SS information in our little bloggy circle! We are evil enablers here. Never ask us if you're on the fence, because we'll always err on the side of "treat yourself!" Those bottle shots are so ethereal and lovely Liz! You describe the scents perfectly. Glad the locket could come in handy. I want to sample those Wolf scents too. I love, love, love SS Lavender Vanilla. I had no idea they had it in EDP. I will sample that one next too. I have my recent order waiting on deck for me to start my writing on them. Enjoy your goodies pretty lady. Thank you! I feel like I'm always experimenting with something with my pictures and I never know how they will actually look until I've loaded the pictures onto the computer. The more I wear Lavender Vanilla the more I fall in love with it. I hope their EDP form smells just as intoxicating! I'm so curious - what does the locket do, Liz? Aside from look dope, that is. :) I'm with Jay - everybody's orders look so fabulous! 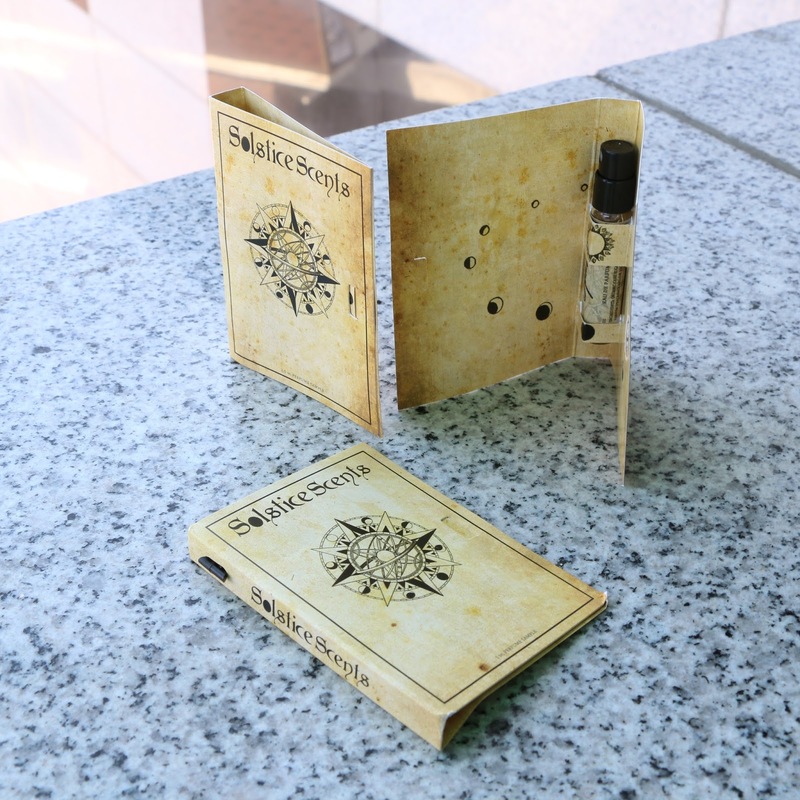 Solstice does such an amazing job with their labels and the overall design - like you said, really suits their kind of undone, rustic sort of aesthetic. Enjoy your goodies! It's kind of like a picture locket except it's designed with "holes" to allow the scent of whatever's inside to get out. Usually you'll stick a piece of fabric or felt with the fragrance on it in the locket and you'll smell just like you're wearing it. It's great for people who have sensitivities to a scent they're otherwise in love with (like scents with cinnamon, for example) or if certain fragrances you love on others/out of the bottle happen to turn on your own skin.